Happy Tuesday everyone! Hope you've had a great weekend and are all set for the coming week. Its turned really cold here, -4 when I went to bed last night, but no snow, much to the kids disappointment (and my relief!). 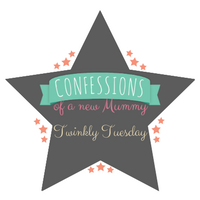 This week's Tuesday Twinkler is a thoughtful post from Kate On Thin Ice. It is a letter to someone from her school who has since passed away and how they never got to know each other, other than to say Hi, when in hindsight they might well have made more in common than they realised at the time. It is a good reminder to us all that we shouldn't make assumptions of others and should scratch under the surface to discover more about them. I didn't know it got that cold in the UK and here I am kvetching about a high of zero. The weather has made a sharp, nasty turn from the previous months, brrrr, keep warm, all.